The second volume in this incredible YA trilogy. When stone hearts break they shatter. Sebastian Grey used to be a normal teenager. Now he’s a creature whose sole purpose is to be a guardian for secretive gypsy clans. When the Romany gypsies claim him, Sebastian is given a second chance to protect Josephine Romany – the girl he loves. But some clan members would rather see a gargoyle in a cage than have one by their sides. If Sebastian is to keep Josephine safe from the shadow creatures attacking her people, he might have to embrace his changes. Even if that means choosing between his humanity and becoming the monster everyone believes him to be. 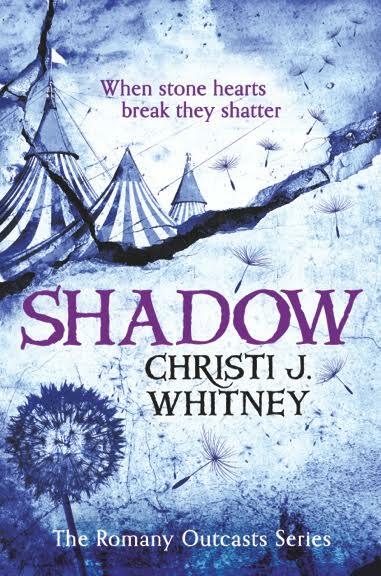 Upcoming Releases by Christi J. Whitney SHADOW (Book 2 in “The Romany Outcasts Series”) – 2 June, 2016. MIDNIGHT (Book 3 in “The Romany Outcasts Series”) – 2017. Read Below for an excerpt from SHADOW! Stephan slid his bow from his shoulder and fitted an arrow to the string. Quentin Marks’ welcoming committee was not something I’d anticipated. I gathered my bags, and Phillipe led our unpleasant little party across the Sutallee Bridge. I unconsciously slowed as we passed over the abandoned mine shaft where Josephine and I had taken refuge so long ago. There was a sharp poke in the middle of my back, right between my pent wings. I fought the insanely strong desire to whirl around and shove the arrow down his throat. Instead, I bit my lip, tasting coppery blood, and picked up my pace. We reached the iron fence that surrounded the Fairgrounds. Phillipe pulled out a ring of keys and opened the gate. I’d assumed everything would look as it had the last time I’d been within the walls of the Circe de Romany. But there were no tents or pavilions. No rides or decorations, either. Only trailers – along with several RVs, trucks, and buses – arranged in a tight circle right in the middle of the property. Their configuration created a large open space in the center of the caravan. Tarps were arranged over tables and chairs. A fire pit had been built, and laundry hung from clotheslines spread between trailers. People bustled around the clearing, preparing for the approaching storm. Another peal of thunder echoed overhead. The clouds had thickened and the sky looked ready to split apart at any moment. ‘Hurry it up,’ said Stephan with another jab to my back. ‘I don’t intend to get wet.’ Lightning flashed. Women scurried to get the clothes off the lines while men anchored the tarps more securely in the ground. Phillipe led me to a small trailer and flung open the door. The howling wind was motivation enough – even without Stephan’s sharp arrow in my back – and I scampered up the steps. My nose instantly wrinkled at the unpleasant smell. Phillipe caught my look. ‘The dog trailer,’ he said. ‘Just be glad they’re out on patrol,’ said Stephan with a malicious laugh. ‘They’re quite territorial.’ The Marksmen backed me into the stinky enclosure, weapons drawn. ‘We’ll come for you when Nicolas returns,’ said Phillipe. ‘Until then, welcome home.’ With that, he slammed the door, locking me inside.